Above photo, date unknown, kindly sent by Mark Jennings. Above postcard, date unknown, kindly sent by Ben Plant. Above photo 2008 by David Antiss Creative Commons Licence. 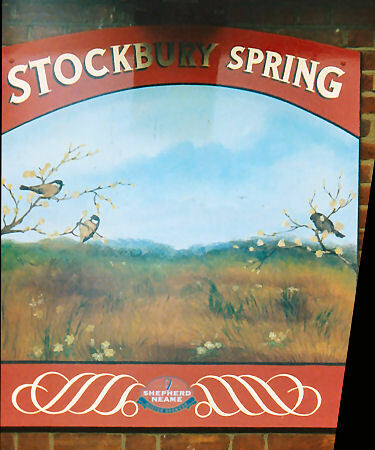 Above sign left, 1988, sign right, August 1992. Above sign left 2011. Sign right, 2018 by Ben Plant. Above photo, 1986, kindly sent by Ben Plant. Above photo, 3 September 2018, kindly taken and sent by Ben Plant. 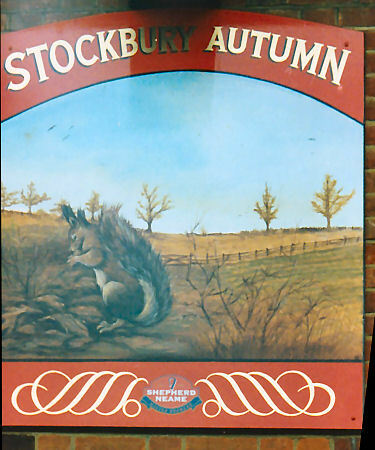 Information taken from their web site:- https://www.theharrowstockbury.co.uk accessed 3 September 2018. Stockbury is an ancient village on the North Downs in Kent. 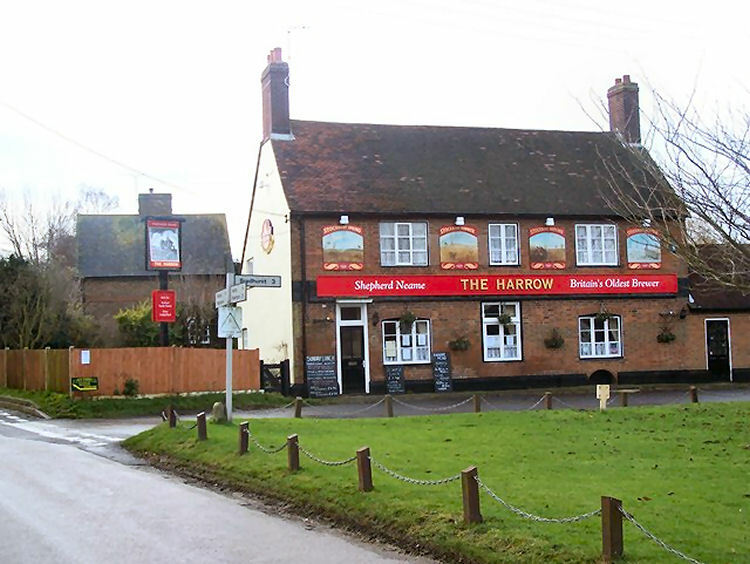 The Harrow is situated by the village green – a very central position for Stockbury village life and an easy meeting point. It always has been; just look at the history. 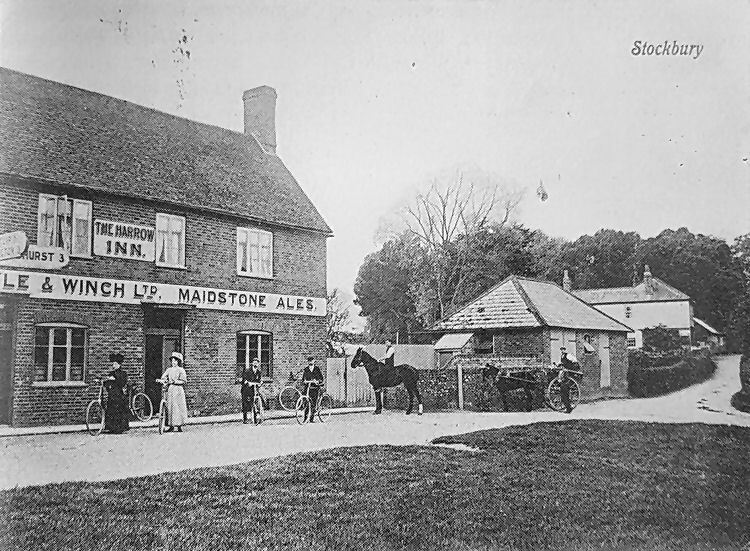 In 1841 this public house was owned by the trustees of Sir John Tilden and occupied by Elizabeth Jennings. Twenty-three years later the trustees of the William Barrow Estate of Borden leased the public house, stables and buildings to Mr. Thomas W. Vallance of the Parish of Lynsted, for one year from October 11th, 1884 at a yearly rent of £22. 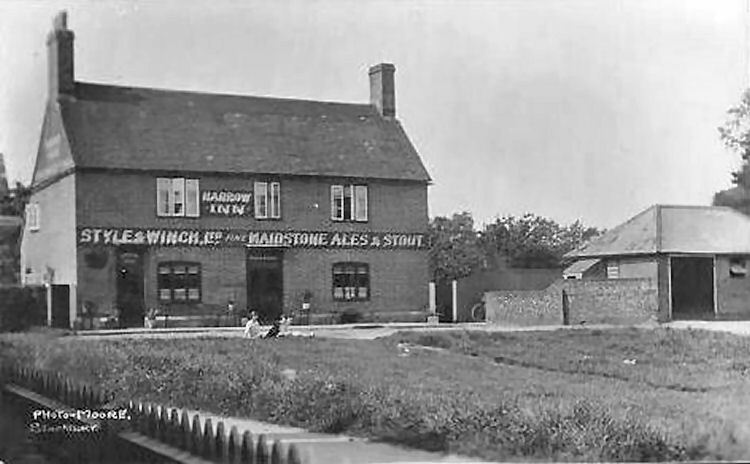 It was to be used only as a public house and to be kept in good repair. By 1897 the trustees were registered as the William Barrow Charity and they sold all the buildings to James Harcourt Vallance and Henry Osborne Vallance for the sum of £2,000. After that, there is an incomplete record of owners. The Harrow Style and Winch. 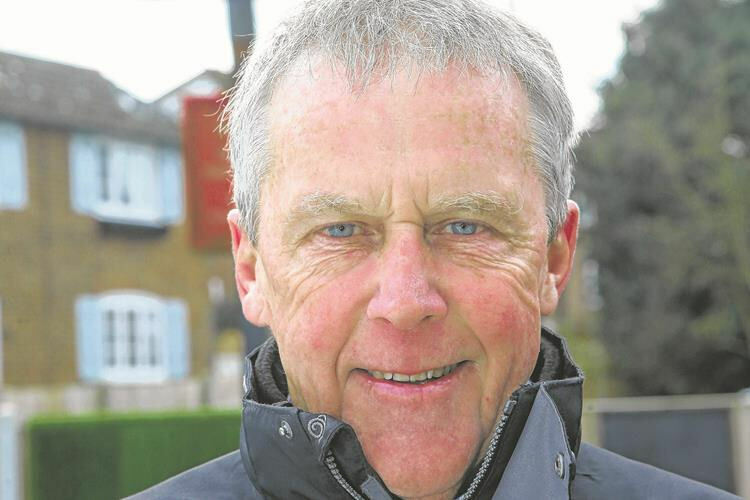 Following Mr. Green came the ‘very popular’ Tim Blackman, who ran a successful darts team. After that the Knights were there for a short while and then Ted and Helen Sedwell took over. During their stay Hattie Jacques, the film actress came to the village to knock down a pile of pennies for charity. She came for no fee and apparently donated a large bottle of gin to the raffle! In 1909 the landlord was Edward Crayden, and he was followed by George Henry Windybank in 1915; then by David Bard in 1918, and Arthur Green in 1923, who it is thought remained for about twenty years. Just as now village clubs abounded; then they were more philanthropic organisations. 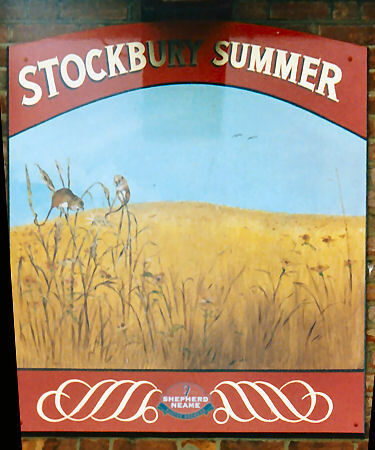 Now they tend to be sports based; all however end up in the pub and add to the great community spirit of Stockbury. Kelly’s Directories of 1908 and 1926 record that various clubs and societies, who had their headquarters in The Harrow, regularly held their meetings there. These groups raised money to relieve the sick or provide for relatives of the dead. One of these, in 1908, was The Harrow Hand of Friendship Friendly Society; another The Lily of the Valley Ancient Order of Foresters which had seventy members. 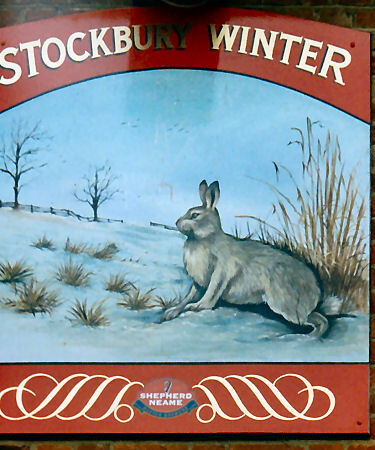 Another group was the Stockbury Burial Club for ‘the insurance of children against death,’ which held its meetings of fifty members every fourth Sunday night. The existence of these groups clearly reflects the central role that the inn played in the life of the community. Here, in the saloon bar of The Harrow are the landlord, Mr. A. J. Sedwell (Ted) and his lady helper, Mrs. Albert Dunk. (from the local paper March 1960) To the left of the picture are the covered shelves of the ‘sandwich bar’! 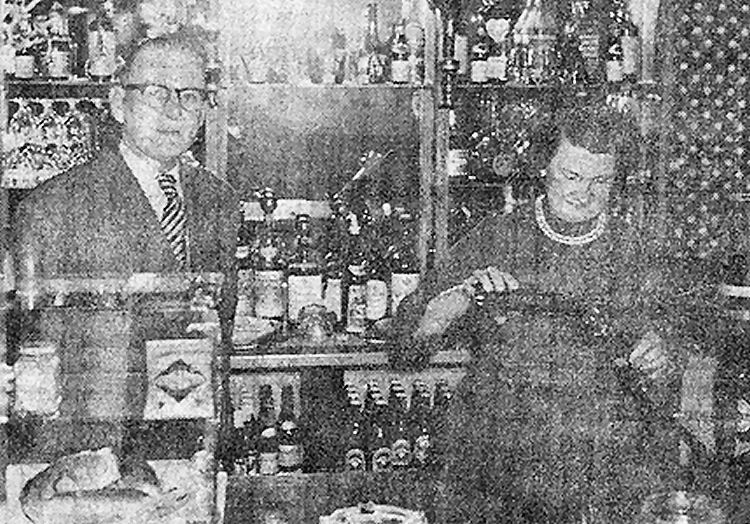 Mrs. A. Dunk helping the landlord of the Harrow, Mr. A. J. W. Sedwell, pours a drink for a Saturday night customer in the saloon bar. 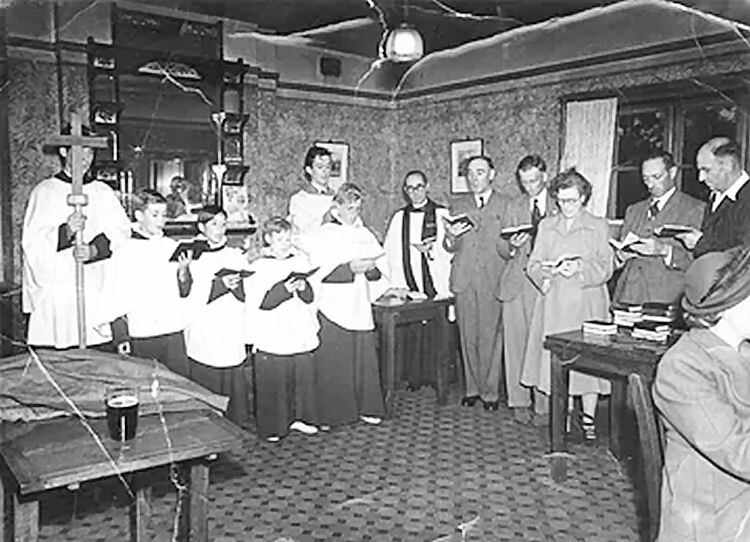 In 1950 The Reverend ‘Wally’ Edwards made the national news when he held a religious service in the saloon bar, with choir boys and hymn books provided. 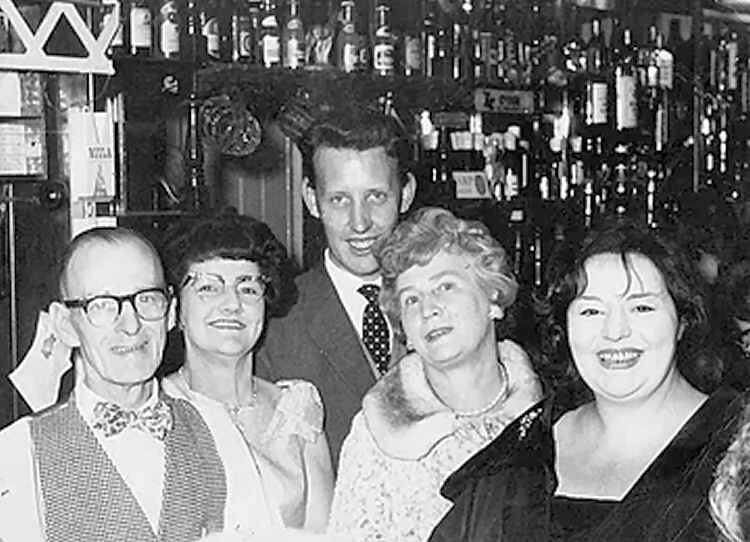 In more modern times, from 1964 Norman and Pat Brown ran the pub. During their tenure they took down the dart board, removed the one armed bandit and made the two separate bars into one long one. At this point I should mention exactly how the layout changed. Originally there were two separate bars, a small wooden floor section to the left as you face the pub, where locals gathered after a day on the land, still perhaps in their working clothes. This was reached by the door generally used as the main entrance today. The saloon bar was accessed through a central door (as seen in the 1905 photo) and inside was separated from the smaller bar by a heavy velour curtain. 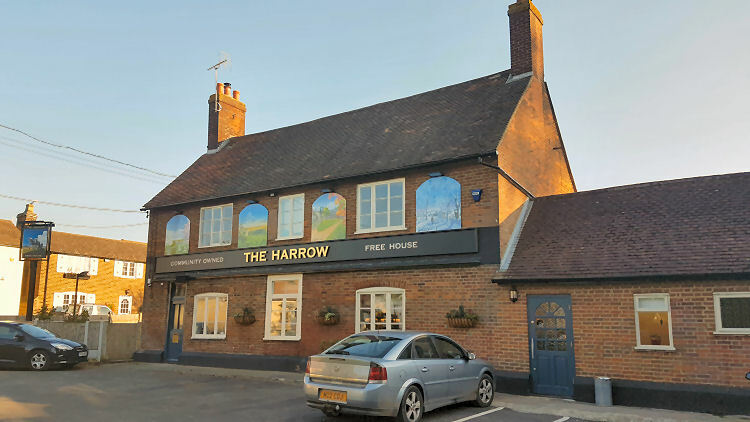 In the 60s and much of the next three decades, once again The Harrow became a focus for village life, hosting many themed evenings, and Christmas and New Year celebrations. 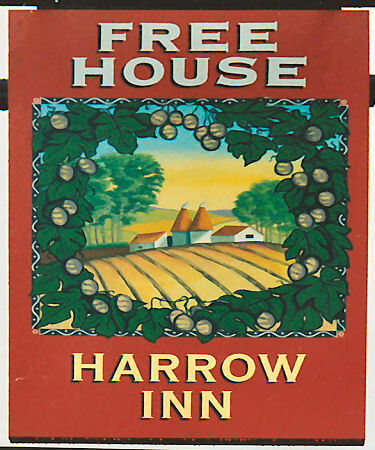 Gradually sandwiches and pork pies were displaced by scampi and chips and gammon and pineapple; then came more sophisticated food and the introduction of a wider selection of wines and aperitifs as in 1983 Chris and Carolyn Plant came to the Harrow and stayed until 2005. 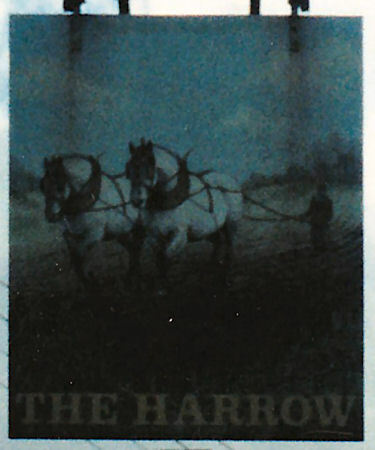 The Harrow was growing up and became very popular. Thereafter various people were responsible for the pub in the next few years, notably a young local woman and her husband for a short while and later a Frenchman, Jean and his partner Lynda who injected a lively flavour into their tenancy, colouring the walls warmly in terracotta and also adding a petanque court into the mix. The game became popular and so they erected lights outside to facilitate late night matches in the summer months. A lively darts team was organised and cricket teas were arranged; weary teams congregating good naturedly in the bar after their matches. Everyone was happy. 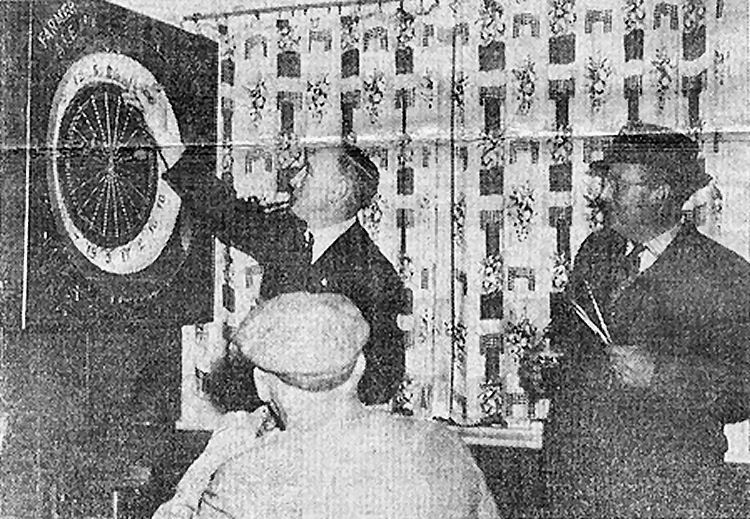 The pipe smoking husband, Mr. A. J. W. Sedwell (1960) who is chairman of the village hall committee, plays darts in the village hall. After that managers came and went leaving the villagers rather shell-shocked and gradually matters went into decline. 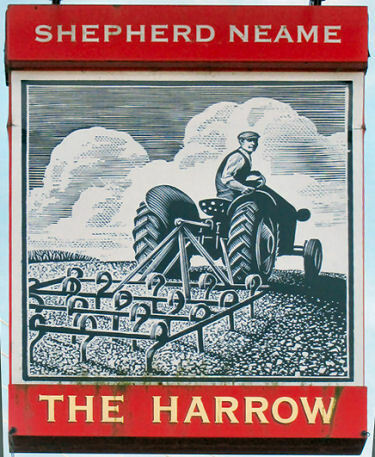 In September 2016 the villagers were shocked to discover that the Shepherd Neame brewery had put the village pub, ‘The Harrow’ up for sale. As we were very fond of our little pub, which is a lovely looking local landmark right on the village green in the heart of the village, a group of us decided to act. Following a packed out meeting in the village hall we all decided to ‘save the pub’ and buy it as a village asset. Fortunately, the Parish Council had previously had the pub listed as an Asset of Community Value which made this easier. A committee was formed, a publicity campaign was launched, a Community Benefit Society was formed and what a result, we now have over 120 shareholders who have invested in the pub. Above photo showing campaigner Chris Porter with two characters from the Muppet Show who helped save the pub. 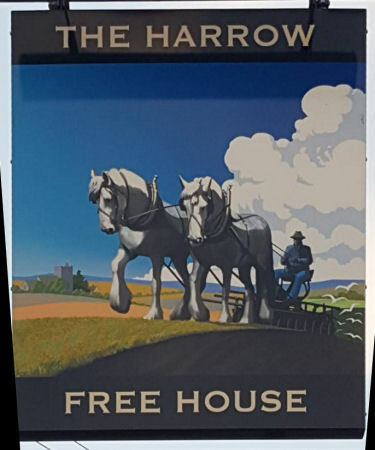 Our aim was to make our traditional English country pub warm and welcoming, a Free House with great beers, fine wines and delicious food sourced from local farms. This aim was achieved as of August 2017. We also expect it will become a place for serving coffees and cakes, teas and snacks and a perfect meeting place to just pop in and socialize with friends, family or just a chat with someone new. We still welcome investors so if you’d like to become part of this exciting project we’d love you to get in touch with us for more information and for application forms. Above photo showing licensee 2018, Samuel Pendry. From the https://www.kentonline.co.uk By Lewis Dyson, 28 December 2017. 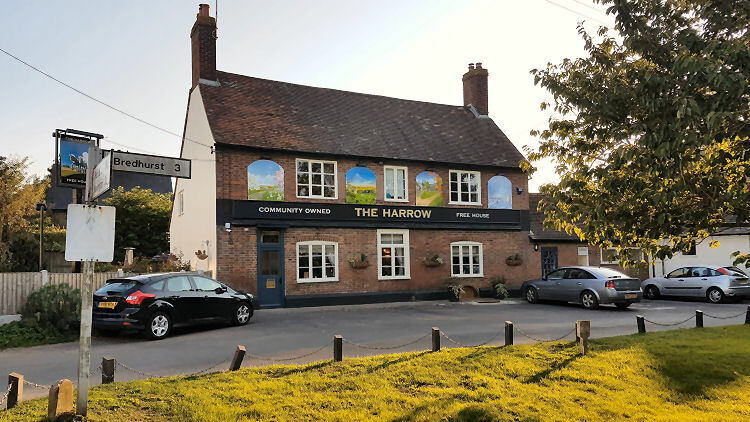 The Harrow pub in Stockbury wins CAMRA Pub Saving Award. A plucky band of villagers who saved their local pub from closure have been recognised for their efforts with a national award. 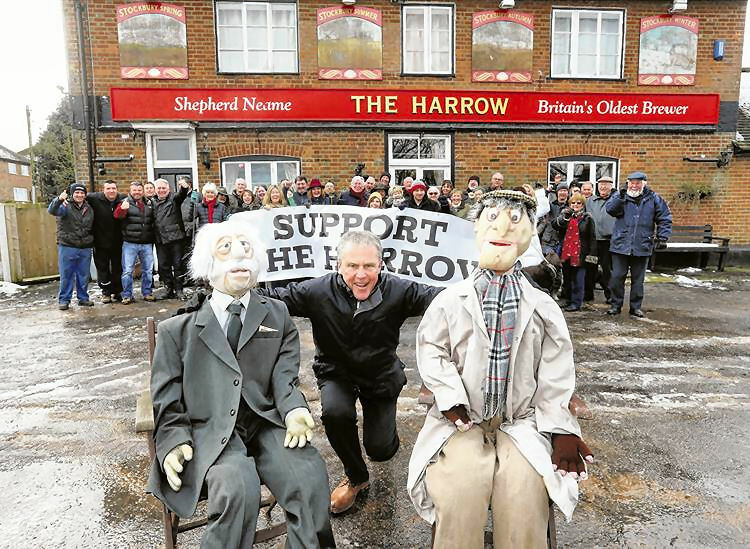 Following months of campaigning, residents of Stockbury purchased The Harrow, a 200-year-old pub that had been put up for sale by brewer Shepherd Neame. The new owners have now won Campaign for Real Ale’s (CAMRA) Pub Saving Award, which recognises communities that prevented the closure of their local. 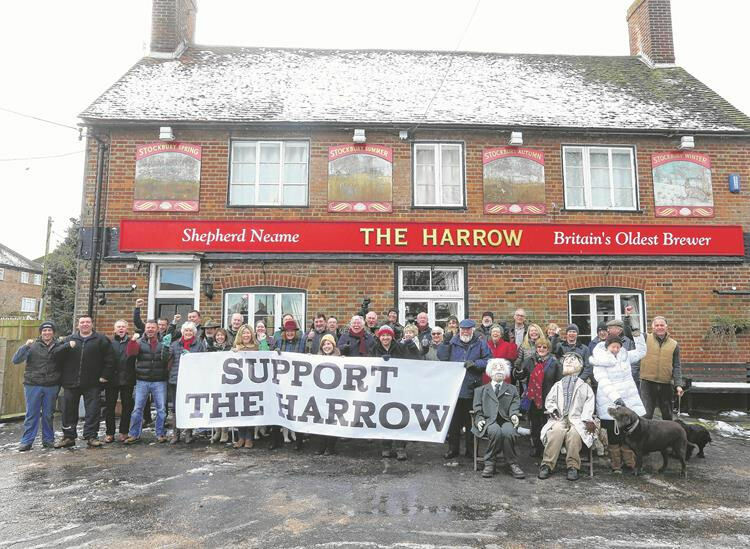 Supporters to turn The Harrow Pub into a community pub gather outside the premises. A group of 140 shareholders was invited to invest between £200 and £20,000 in order to secure the £380,000 needed to save the site. They also secured funding from the Plunkett Foundation and More Than A Pub. The campaigners raised awareness through various quiz nights, barbecues and village performances. 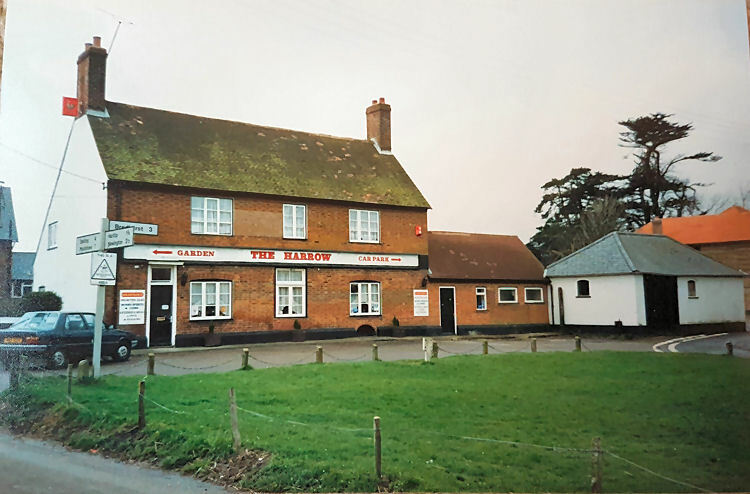 MP for Faversham and Mid Kent Helen Whately wrote to Jonathan Neame, chief executive of Shepherd Neame, and councillors also donated towards the refurbishment. 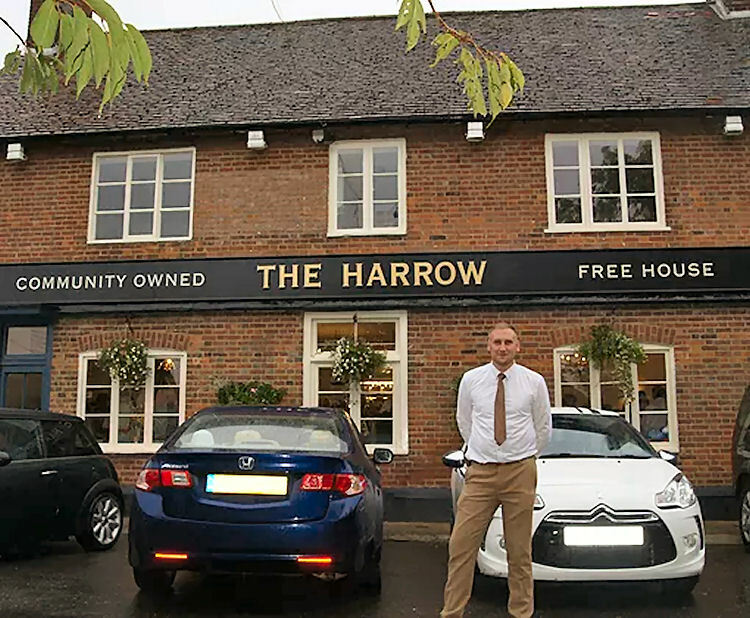 Chris Porter, who started the campaign to make The Harrow an Asset of Community Value, said: “It is a fantastic achievement to have saved this pub from closure thanks to the help of hundreds of people – stakeholders, villagers, councillors, press, MPs and groups like Pub is the Hub and Plunkett. Since the pub re-opened in August it has introduced a regular social lunch for vulnerable members of the community with a pick-up and drop-off service, a book swap and an internet cafe for those with poor connections. Darts and petanque teams have also returned.